It is now the evening of 2011 December 31st in Japan…a few hours ’til New Years Day 2012. So, what do you think the five biggest news stories of 2011 were? ● The 2011 March 11 earthquake and tsunami in Tohoku, Japan. ● The ten year anniversary of the 2001 September 11th terrorist attacks in America. ● The death of Muammar Gaddafi on 2011 October 20. ● The death of Osama bin Laden on 2011 May 2. ● The Occupy protest movement. Which events epitomized this past year to you? Tell me in the comments section of this post. Is it right to cheer? It was reported on the news yesterday that the self-credited mastermind of the 2001 September 11 terrorism attacks on the World Trade Center and the Pentagon in America, Osama Bin Laden, was killed by the American military. Without a doubt, anyone responsible for crimes against humanity such as Bin Laden was should be brought to justice. But I’m not sure I agree that the celebrations and cheering across America that was shown on the TV news yesterday is appropriate. 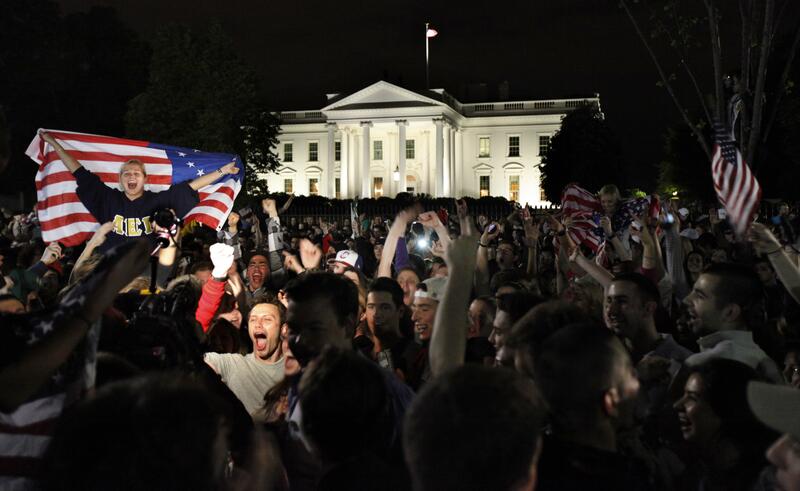 A crowd in Washington DC cheered the news that Osama Bin Laden was killed in a firefight with the U.S. military. The Americans crowds that were shown on TV were chanting “USA! USA! USA!” and singing pro-America songs such as the American National Anthem. It reminded me of the images of the reaction in some Middle Eastern countries about ten years ago after the WTC attacks on America. There were some anti-American crowds in some countries who were cheering America’s loss. It was quite offensive to see! I certainly wouldn’t compare a villain such as Bin Laden to the innocent lives lost on 2001 September 11th…but seeing Americans cheering may fuel “anti-American” feelings in some countries.